🏆A 2018 Wattys Winner🏆 Two boys, one ethnically segregated town. Two sides, one war. Yuri Karamov's existence is like Schrödinger's cat, simultaneously both dead and alive. In Ru Konstantin's mind, Yuri is still the same vibrant young man he was when their lives diverged on different paths. But the question, the one Ru is too afraid to acknowledge, is whether his best friend is still alive. In the short span of eighteen years, their hometown of Dronesk has gone from a humdrum town to becoming a besieged territory of the BKA. A radical militia group whose sole purpose is to eradicate the Arash--people like Ru--from Rujga Province. Yuri Karamov is one of the recruits fighting for a Brommian liberation. When Ru returns to Dronesk in search of his best friend, everything he knew from before is turned on its head. Confrontation bubbles under the surface of their volatile relationship as both men grapple with the ramifications of a separatist movement. 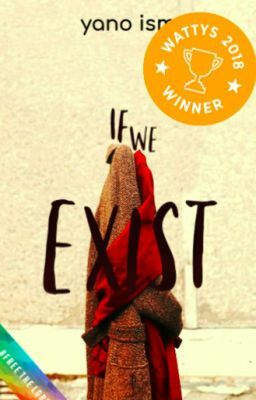 If We Exist, is a coming-of-age story that examines friendship, sexuality, class struggles and ethnic tensions through the lens of Ru Konstantin; desperate, anxiety-ridden, and awfully nostalgic.